Grilling... in December... In Minnesota! Yes I told you we are going crazy. I called my dad yesterday while at work to ask about a Christmas present, and was presented with the question on if I would want to grill for dinner! Yes my friends I realize it is the middle of winter (or at least it is supposed to be) and yes I realize I have already talked about temps that have gone down into the teens! But for some very odd reason Minnesota has hit a sort of warm spell, and by warm spell I mean it is 37 degrees! I know I know 37 degrees doesn't seem that warm, but compared to 10 degrees that is a wonderful and much appreciated heat wave! But I am not complaining, I will take whatever I can get right now! So yes while you are contemplating the sanity of my family up here in Minnesota let me share some lovely pictures of our dinner. Yes that would be the dinner my father grilled outside, in December, in what is supposed to be a SNOWY and COLD! We had a bit of rain, but that didn't stop my dad from firing up the grill! He was busy grilling up some yummy tomato basil chicken! 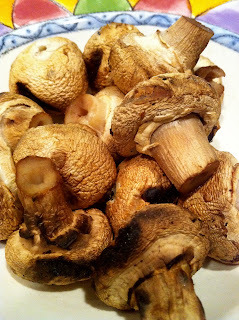 Grilled Mushrooms, hands down my favorite! Nothing like a grilled meal in the middle of winter! Want a great quinoa recipe, check this one out! I loosely followed this recipe from Liv Life for her Mushroom and Broccoli Quisotto! It was a delicious, had the flavor of risotto, but the texture I love about quinoa! Has your family ever gone to extremes to make a great meal? 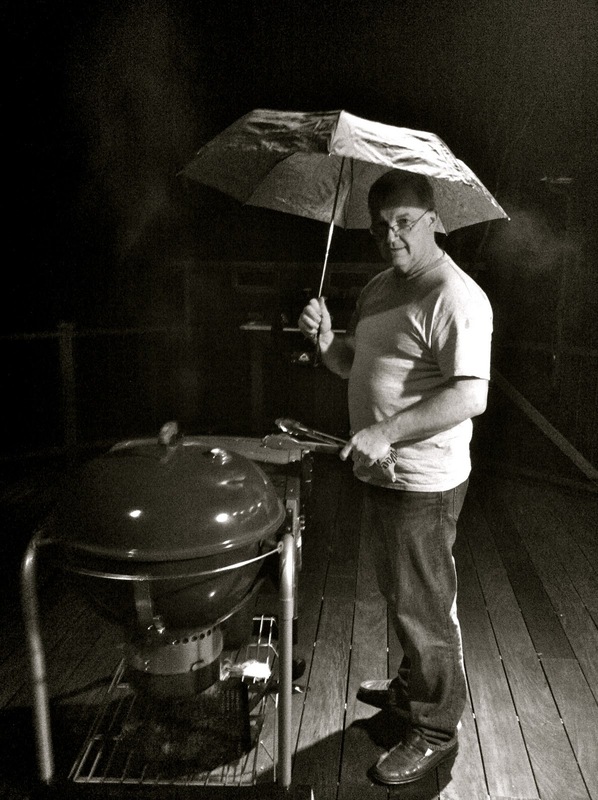 Say grilling in the rain? Just 2 short days till the weekend! I love it! Stephen cooked barbecue for us on Sunday and he slow cooks it allll day long. It happened to be one of the coldest, windy days we have had yet too! My dad grills year round, too. It keeps you sane and starves off those winter lbs! Ohhhh my mouth is watering! That chicken looks delish!! We grill year round!! It got warm this week here. It's like 60 today! Such a nic post, I enjoyed it a lot! I love barbeques! looks like the meal was worth it! Not crazy! Genius! I could totally go for some grilled food!! As long as someone else will do it out in the cold! YUM! Yummy! That chicken looks so good!! Hope you're having a good week! must be freezing! 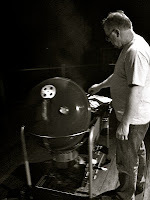 I need to grill more - I live in LA and we rarely do! I'm not judging at all! Sometimes all you need is something grilled in the winter time. And I might add I love the umbrella picture! I have a very similar one from my birthday party in April. yum that dinner looks excellent. why didn't i get an invitation to dinner? nothing wrong with grilling in the middle of winter, grilling is a great way to prepare a meal anytime! I say do it as long as you can! Looks yummy! 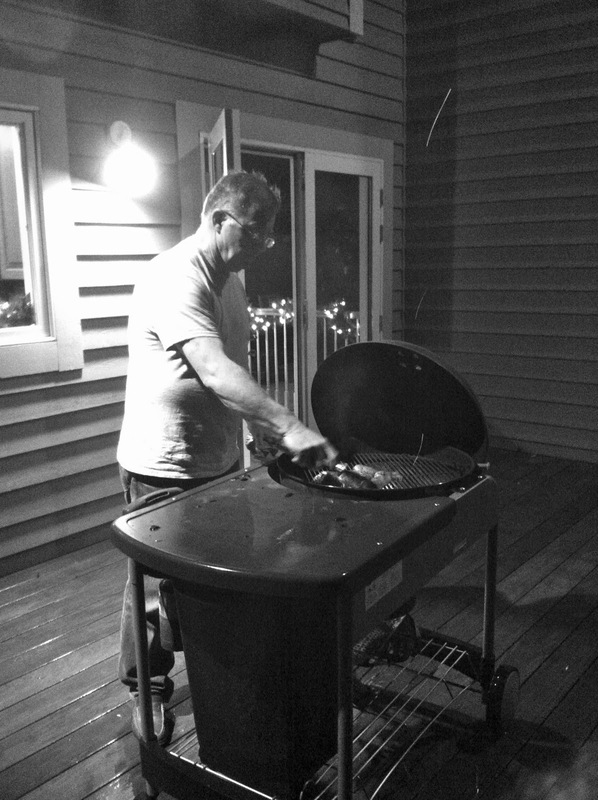 I'm with you- cold weather doesn't stop me from grilling! Yalls meal looks SO good! That looks really good!! BBQ any time of the year is awesome. Those mushrooms look fantastic. Tomato basil chicken sounds really, really good. I love that you grilled in the middle of winter. How fun! i am even more surprised that he's wearing a t-shirt!!! Haha, here in Washington, we hit a warm spell too... so like 41 degrees :) maybe it's time for us to whip out the grill, too! ?